Three men's morris is an abstract strategy game played on a three by three board (counting lines) that is similar to tic-tac-toe. It is also related to six men's morris and nine men's morris. A board for three men's morris. This pattern has been found carved into the roof of the temple of Kurna. Each player has three pieces. The winner is the first player to align their three pieces on a line drawn on the board. There are 3 horizontal lines, 3 vertical lines and 2 diagonal lines. The board is empty to begin the game, and players take turns placing their pieces on empty intersections. Once all pieces are placed (assuming there is no winner by then), play proceeds with each player moving one of their pieces per turn. A piece may move to any vacant point on the board, not just an adjacent one. According to A History of Chess, there is an alternative version in which pieces may not move to any vacant point, but only to any adjacent linked empty position, i.e. from a corner to the middle of an adjacent edge, from the middle of an edge to the center or an adjacent corner, or from the center to the middle of an edge. H. J. R. Murray calls the first version "nine holes" and the second version "three men's morris" or "the smaller merels". Boards were carved into the cloister seats at the English cathedrals at Canterbury, Gloucester, Norwich, Salisbury and Westminster Abbey; the game was quite popular in England in the 13th century. These boards used holes, not lines, to represent the nine spaces on the board—hence the name nine-holes—and forming a diagonal row did not win the game. The name of the game may be related to Morris dances (and hence to Moorish). However, according to Daniel King, "the word 'morris' has nothing to do with the old English dance of the same name. It comes from the Latin word merellus, which means a counter or gaming piece." Six men's morris and nine men's morris use six and nine pieces, respectively, and are played on different boards. 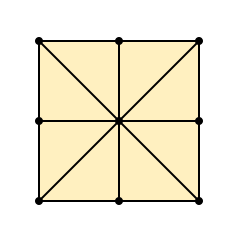 In tic-tac-toe, pieces are placed (or marks are made) until the board is full; if neither player has an orthogonal or diagonal line at this point, the game is a draw. Achi, from Ghana, is played on the kurna board. Each player has four pieces, which can only move to adjacent spaces. Picaria, a Native American variation invented in New Mexico, adds diagonal attachments to the central edge points, yielding four additional interior points each located between the center and corner points. ^ a b c d Bell, R. C. (1979). Board and Table Games from Many Civilizations, volume 1. New York City: Dover Publications. pp. 91–92. ISBN 0-486-23855-5. ^ A History of Chess, p. 614. ^ Berger, Friedrich (2004). "From circle and square to the image of the world: a possible interpretation for some petroglyphs of merels boards" (PDF). Rock Art Research. 21 (1): 11–25. Archived from the original (PDF) on 2004-11-21. Retrieved 2007-01-12. ^ Culin, Stewart (October–December 1900). "Philippine Games". American Anthropologist. New Series. 2 (4): 643–656. doi:10.1525/aa.1900.2.4.02a00040. JSTOR 659313. ^ "Tapatan". Row Games. Elliott Avedon Museum and Archive of Games. 2005-09-12. Archived from the original on 2007-02-08. Retrieved 2007-01-09. ^ "Nine Holes". Row Games. Elliott Avedon Museum and Archive of Games. 2005-09-12. Archived from the original on 2007-02-08. Retrieved 2007-01-09. ^ King, Daniel (2003). Games. Kingfisher plc. pp. 10–11. ISBN 0-7534-0816-3. ^ Bell, R. C. (1979). Board and Table Games from Many Civilizations, volume 2. New York: Dover Publications. pp. 55–56. ISBN 0-486-23855-5. ^ Simonds Mohr, Merilyn (1993). The Games Treasury. Shelburne, Vermont: Chapters Publishing. p. 28. ISBN 1-881527-23-9. Murray, H. J. R. (1952). A History of Board Games other than Chess. Oxford University Press. This page was last edited on 20 November 2018, at 23:06 (UTC).